You may have noticed that in the past 7 or 8 years there has been an increase in the popularity of personalised wristbands. They are used for a wide range of purposes across many different industries and have helped raise money and streamline event logistics right across the globe. Personalised wristbands have been used to show support of causes such as high profile diseases, the environment & racism. They have had a huge impact in a variety of areas for a time they changed the landscape of how charities and causes market themselves to the wider public. Types & Materials of Personalised Wrist Bands. The versatility of wristbands is well known, it’s this versatility that makes them so accessible to personalisation. You can find plethora of customised wrist bands on hundreds of online stores, with most selling to the general public as well as to companies. 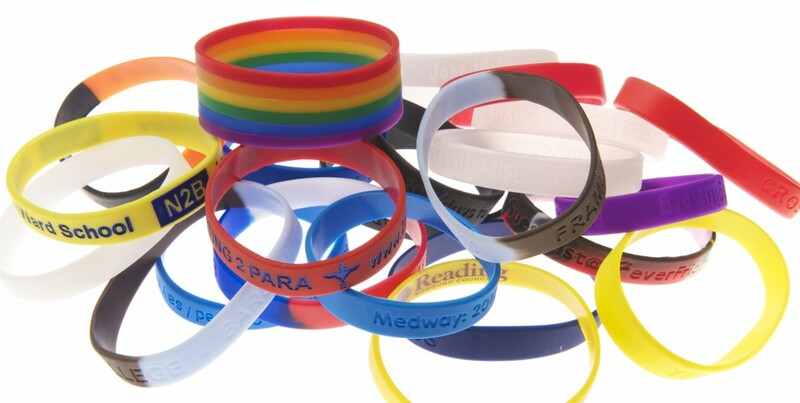 Personalised wristbands are usually made from very light & durable materials such as silicone, neoprene or plastic but are also made from vinyl, paper, leather and fabric. They are comfortable to wear and come in all manner of colours and designs and patterns. This incredible range of styles, materials and colours have helped push personalised wristbands beyond merely function into the realm of fashion and long term commemorative keepsakes. Most famously of course is the medical wristband that identifies new born babies, medical wristbands are also worn daily by people with particular disorders such as special blood types. Personalised WristBands for Charitable Causes. Since 2004 when Lance Armstrong used the ‘LiveStrong’ cancer support wristband, personalised wristbands for charities have become incredibly popular with charitable causes where they are used to raise money and awareness. People can purchase the wristband and wear it daily to show their support for the cause they have become interested in. In many instances people may not have a great deal of money to give to a cause so the purchase of an inexpensive personalised wristband won’t break the bank. This also makes giving to charity much more accessible to the everyday person. The cost is kept down due to most charity wristbands being produced from moulded silicone which helps keep the cost per unit very low. There are also big discounts to be made by organisations that buy the wristbands in bulk. Some of the charitable causes that have used personalised wristbands. Personalised Wrist Bands for Events. Another use for personalised wristbands is in the running of events. Selecting the correct wristband for your event can be dictated by a wide range of factors. Different coloured wristbands can be used to identify access eligibility to zones or services. They can also be used to promote your other services or event by having various logos and other promotional collateral printed on them. Almost every aspect of colour and material can open to bespoke customisation. Some of the uses personalised wrist bands can have for your event. With such a wide range of uses for wristbands and the incredible power they have harnessed for marketing charitable causes it’s no wonder that the personalised wrist band has become such a popular item and are worn by people from all four corners of the globe.